COOCHEER Camera Slider 32""/80cm comes with modern and fashion design, diversified combination and all-round move, making the shooting preciser and more stable. Perfect for YouTubers/short filmmakers who want to shoot dramatic video cinematography or slow motion moving photo.It is a necessary accessory for making better videos cause you get more video material from different angels. 1/4"" & 3/8"" screw holes on both ends and middle for multiple mounting options. 1/4"" & 3/8"" screws built-in the top for connecting with camera or ball-head. 1/4"" & 3/8"" thread holes built-in the bottom for connecting with tripod. Slider Only! Camera, ball head, Tripod Head and Tripod is Not Included! 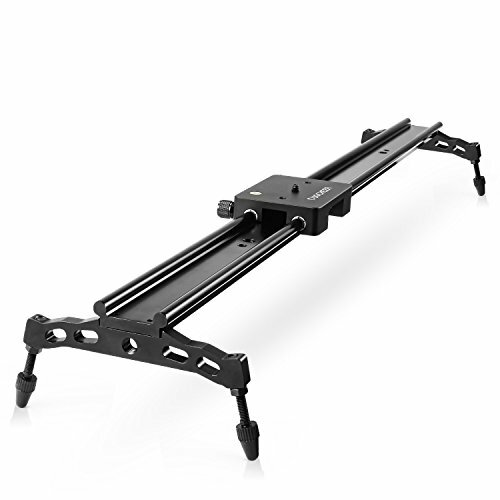 ▶Stability and Smoothness: Sliding smoothly and quietly without too much noise.adding smooth sliding motion to your video productions with 19mm Track Rails, the non-skid rubber feet increases the friction between slider and ground making sliding stably. ▶Multifunction Support:You can angle the slider to get straight horizontal shots, or you can slope it on a tripod, position it vertically on a tripod, use it as a crane on a tripod, or even attach it flipped over on two tripods. ▶Precise Operation: The large 3 x 4cm carriage with a 3/8"-16 and 1/4"-20 attachment screw accommodates ball head, flat-base fluid heads and tripods of various sizes,in addition, there are 1/4"-20 and 3/8"-16 threads on the carriage that are useful for mounting optional accessories. ▶Lightweight Device:The slider is made of aluminum alloy, lightweight but very durable easy to carry with an included carrying bag, excellent company for video making.